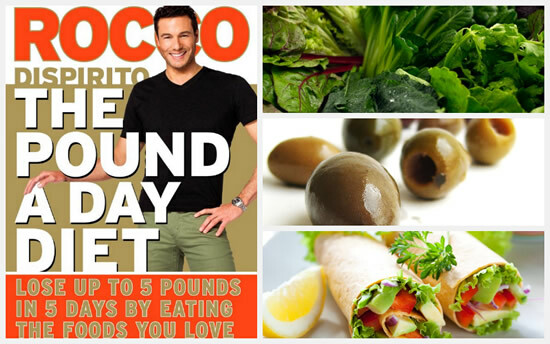 Lose 1 Pound a Day Diet comes from Rocco DiSpirito, who is a James Beard award-winning chef and author of nine cookbooks. His contributions include the New York Times bestselling “Now Eat This! Diet”. In The Pound a Day Diet, DiSpirito offers readers an accelerated program to help dieters lose up to five pounds in five days. He promises that you can achieve this while still enjoying all the foods you love. A Pound a Day aims to dispel the belief that a slow, steady loss is the best way to lose weight. His program is designed to give you rapid results, which increases your motivation to stick with a healthy diet. The plan is based on what Rocco Dispirito calls “calorie-corrected” and “carb-corrected” foods. It includes two phases that both adhere to the guidelines of a Mediterranean style of eating. The first phase lasts for 4 weeks – or until you reach your target weight. It is based on the scientifically validated method of creating a calorie deficit that triggers weight loss. You will consume 850 calories on weekdays and 1,200 calories on weekends. If you stick to the meal plans you can lose up to twenty pounds at the end of the 28 days. It is extremely important that you don’t skip meals. Even if you are not hungry you should eat a small portion of the designated meal to keep your metabolism revved up. This phase begins when you reach your goal weight and continues as a healthy approach to weight management. The Pound a Day Diet shows you how to balance your portion size and eat more plant-based whole foods including vegetables, fruits, and whole grains. At this point calories do increase daily, but the Mediterranean diet principles are still followed. According to DiSpirito, the best way to shed extra pounds is to eat for pleasure and truly enjoy your meals. The more pleasure you get from food, the less you will need to eat to feel satisfied. The book includes 60 recipes containing low-carb, high-fiber, lean protein “diet booster” foods. These are specific low-calorie-density foods that can actually accelerate healthy weight loss by “supercharging your body’s calorie-burning power”. Salmon, shrimp, turkey bacon, chicken breast, lean beef, reduced-fat cheese, egg whites, hummus, almond milk, natural peanut butter, broccoli, tomato, cucumber, avocado, bok choy, sweet potato, berries, apples, papaya, monk fruit extract, agave nectar, green tea. To lose weight you have to create a calorie deficit and exercise is a critical way to achieve this. The Pound a Day Diet says you can’t expect to successfully lose weight and keep it off if you don’t exercise. All you need is 21 minutes a day of moderate physical activity like brisk walking. For an even greater fat-burning effect, work up to 34 minutes, which can be just two 17-minute walks. The Pound a Day Diet: Lose Up to 5 Pounds in 5 Days by Eating the Foods You Love retails at $26. Produces rapid weight loss results. Advocates increasing the intake of a variety of plant-based whole foods. Includes 28 days of menu plans. Pound a Day Diet Recipes are simple and quick to prepare. Author is an award-winning chef. Can be difficult for many dieters to completely eliminate sweet and starchy foods. Calories are below that recommended by most health experts for healthy weight loss. Diet does not provide enough energy to fuel physically active individuals. A large proportion of the weight loss is likely to be fluid and muscle rather than fat. Dieters often experience rebound weight gain after following a low-calorie diet. The Pound a Day Diet is a program designed to help you lose weight fast. It is based on a low-calorie Mediterranean style of eating. This plan will probably produce quick results because calorie levels are extremely low. However, the majority of health experts do not recommend such rapid weight loss because of potential negative health effects.